Glorious toolbox for magical ruin-crawls! So this time around, Alexander Augunas guides us through the process of making strange Mystic Ruins an alternate dungeon-area – but what exactly does that entail? Well, first of all, we receive what amounts to incremental degrees of 5 (anti-) magic levels -from dead to wild magic to ruins that enhance certain types of magic, these modifications instantly change the dynamics of your dungeon-ruins – pretty cool! But beyond magic levels, we also receive effects that see locomotive modifications become unstable, hypnotic sounds and yes, grasping vines. The general suggested features provided, including dizzying haze, multi-level design that allows for the scouting (and potentially skipping) between vertically aligned levels and mutagenic properties (in the form of a simple penalty, but you can always make that one more complex) -these make for interesting and unique modification-suggestions. So far, so good – what about sacking the place? Well, from living steel t power cmponents and alchemical and arcane reagents, we receive a bunch of cool, thematically-fitting loot suggestions, some even with nice in-game bonuses. Dressing of the ruins is also provided for, with considerations of different sample functions and the harvesting of dressings-section features some nice scaling suggestions of the modifications provided. The pdf does include a massive table with 37 entries (plus toll twice/thrice) – and once again, the table is pretty damn glorious: What about having everything in the ruins slowly shrink? A nice coat of nasty mold or slime? Nascent magical auras? Or the fact that unattended woo immediately bursts into flames? A couple of the entries here are downright inspired and should suffice to create a ruin that has its function and history develop organically from its dressing outwards – and if this table does not suffice, just add wilderness/dungeon dressing and you’re good to go! 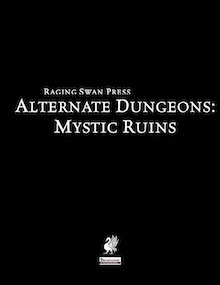 The next page would be devoted to suggested monsters to encounter within the ruins and while useful for novice DMs, so far in every installment of the series this chapter has tended to bore me, the selection this time around is more interesting and diverse, so kudos! Speaking of kudos – I love what follows next – from mundane collapses and hazards to magical ones and even planar thinning with chaotic surges from limbo/maelstrom, this chapter really is nice and a great cheat sheet to make exploration more memorable. Speaking of prior issues of the series – whereas so far the adventure hooks were functional, but not particularly inspired, we may not receive less, only 2, but the two that we get actually are pretty awesome -from leaks in the planar fabric to goblinifying devices, the hooks are inspired and cool – two thumbs up! Alexander Augunas’ latest Alternate Dungeon-installment is inspired in all the right places. When I read “Mystic Ruins”, I was expecting a generic train-ride of blandness and “been there, done that”- tricks. Well, I am happy to report that even experienced DMs can find quite a bunch of cool stuff herein! Best of all, while generic enough for newbie DMs to use, this still manages to maintain the balance between generic and specific, generating its very own identity. A fun, cool little pdf that should definitely help keep boredom away. Surprisingly fun and very inexpensive, this pdf is well worth 5 stars + seal of approval. You can get this useful toolbox here on OBS! Also, the designer Alexander Augunas is currently running a kickstarter for a massive Pact Magic-book – check it out here!